Engineer- Primeval Riley head on 10th Doctor (spacesuit) body. 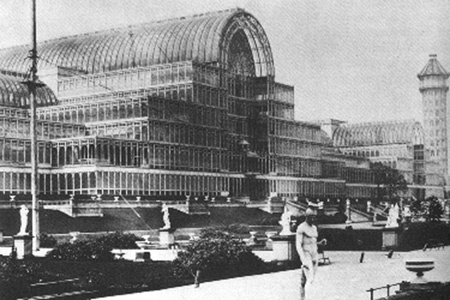 A number of figures were collected together to form the visitors to the Crystal Palace. During the reshoot, it became apparent that we needed some security guards. There seemed to be no one suitable until we chanced upon SV7 and his DUM friends- the perfect 'people' to run security and information at the exhibition. The cameo engineer at the start of part two was a photoshop composite of the 10th Doctor's spacesuit body and Primeval's Captain Riley. The 2009 reshot version was posted at the end of May and June. 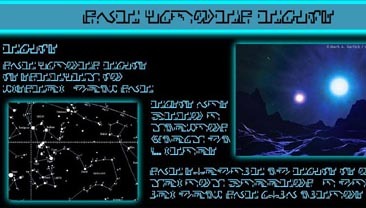 The original version was put on the site March and April 2006 and removed when the site was taken down in early 2007. Out of interest, you can view the original version here. While the original was shot in early 2006, the new version was filmed over two days. The Zygon ship and power grid scenes were done first on 25 Feb 09 with the rest of the scenes, including the main great hall were done on 8 March. Among the artefacts in the exhibition are the K1 Robot, a number of Buffy accessories and the arm of a Tomb of the Cybermen Cyber Controller. Hugo's time machine used to be a hamster ball and is actually a work-in-progress Sontaran ship. 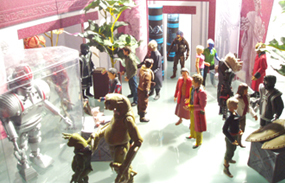 The reshoot uses the same sets as the original, in some cases rescaled to the larger size figure. The Zygon ship used red and green filters on the lights to give a (hopefully) more authentic look as this test shot shows. Ofcourse, Elgis is a corruption of the Helquis, the name of the planet where Torchwood was killed by the Daleks 3000 years prior to this adventure. Come and see the Far Flung Man. 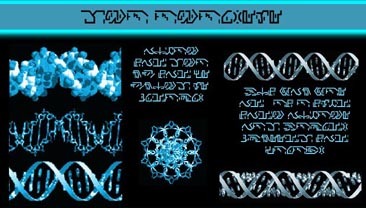 These human remains were discovered by Obarian archaeologist NeBab Scroma on the dead world of Elgis. ELGIS- Location shown, is the former home to a race of highly intelligent humanoids. It used to be an oceanic world. The human remains were found at the bottom of one of the dried up oceans suggesting a burial at sea. Scroma quickly dscounted the possibility that humans once lived on Elgis. This is the only human body to be found on the thoroughly explored world. Carbon dating reveals that the human (a male) was in his 30s/40s at the time of his death and had been dead for over 3000 years. The cause of death is difficult to determine given the decay of the internal organs. Certainly none of the bones are broken so death was unlikely to have been caused by physical trauma. Natural causes, some kind of organ failure or even drowning may be responsible. But given that he was the only human on Elgis at a time when humanity was barely across the solar system, how did he get there? Taken by aliens? Victim of a freak transporter accident? The Mystery of the Far Flung Man may never be resolved. 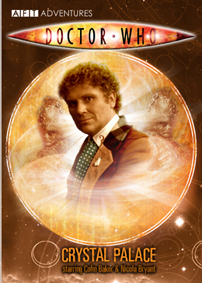 Previous drafts of the story highlighted the corruption of the Great Earth Empire and was intended to suggest that despite their extreme methods, the Zygons did actually have a legitimate grievance. Some lines cut from the script suggest that the Crystal Palace space station was actually a stolen Zygon ship but the idea was dropped. One of the purposes for the original adventure was to bring back Thadius Torchwood. He had been killed by the Daleks in 2003 but the plan was to bring him back for his own series and before the BBC got in with their spin off of the same name. He almost appeared in The Ship of Death but eventually ended up as a sideline in Crystal Palace. It was also intended that as something different, this story would debut audio-only companion Evelyn Smythe played by Maggie Stables. Unfortunately the original figure I made of her was absolutely dreadful, so the script was adapted to accommodate Peri instead. By the time I'd made a half decent Evelyn figure, the 3.75" scale had been dropped in favour of CO's 5" figures. 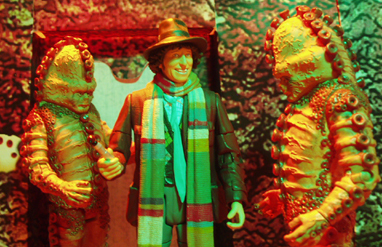 In 2008, CO introduced a wave of classic figures including the 6th Doctor and Zygons and I was eager to include them in a story. 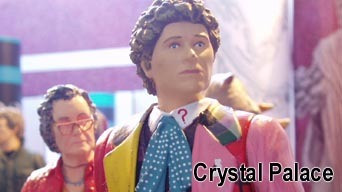 Rather than write something new, it was easier to reshoot Crystal Palace (a story I'd never been happy with) using a new custom 5" Evelyn. This is a one-off though. Don't expect any other old stories to be reshot soon. As for the AFT's original Torchwood series, that enjoyed one episode in 2006 before being dropped. You can all about that here. Apologies to strict continuity fans as the original version of this story is now erased from time. It's an Evelyn story as was always intended, not a Peri story. The original is presented here as a curio but as far as the AFT/ Who cannon is concerned, it didn't happen. The original version was presented with mouse-over images for some action scenes. If you see a panel with a red outline, run your mouse over it to reveal the next panel. This attempt to make the AFT more dynamic was eventually dropped. If you don't realise you need to mouse-over, you miss part of the story and it doesn't make sense! For the 2009 reshoot, the new images were mostly overlaid on to the original panels so sometimes they don't fit quite so snugly on the page as they should. Sorry about that.